Brymner, Douglas (1906). Report Concerning the Canadian Archives for the year 1905, Volume 2. Ottawa: S. E. Dawson. http://books.google.com/books?id=ga4NAAAAYAAJ&pg=RA4-PA140. Everest, Allan Seymour (1977). Moses Hazen and the Canadian Refugees in the American Revolution. Syracuse University Press. ISBN 9780815601296. McGuire, Thomas J (2007). 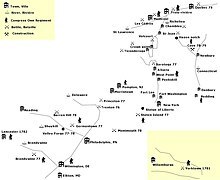 Germantown and the Roads to Valley Forge. Stackpole Books. ISBN 9780811702065. Noel, Francoise (1992). The Christie Seigneuries: Estate Management and Settlement in the Upper Richelieu Valley, 1760-1854. McGill-Queen's Press. ISBN 9780773508767. Stanley, George (1973). Canada Invaded 1775-1776. Hakkert. ISBN 9780888665782. Wells, Frederic Palmer (1902). History of Newbury, Vermont: From the Discovery of the Coos Country to Present Time. With Genealogical Records of Many Families. The Caledonian company. OCLC 383086.